Our professionally trained groomer possesses the expert knowledge needed to simultaneously offer skilled grooming services, safety and comfort to our patients. She can provide your pet with a simple shave to a full breed clip. She offers a full service groom which includes hair cut, nail trim, and bath. 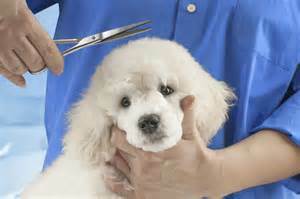 We require that all of our grooming pets are current on Rabies and distemper/parvo and Bordetella vaccinations.